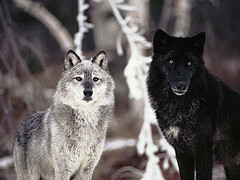 Grey and Black serigala. . Wallpaper and background images in the serigala club tagged: demonwolf picture image photo wolves wolf. This serigala photo might contain serigala kayu, serigala abu-abu, canis lupus, serigala, and abu-abu serigala canis lupus.